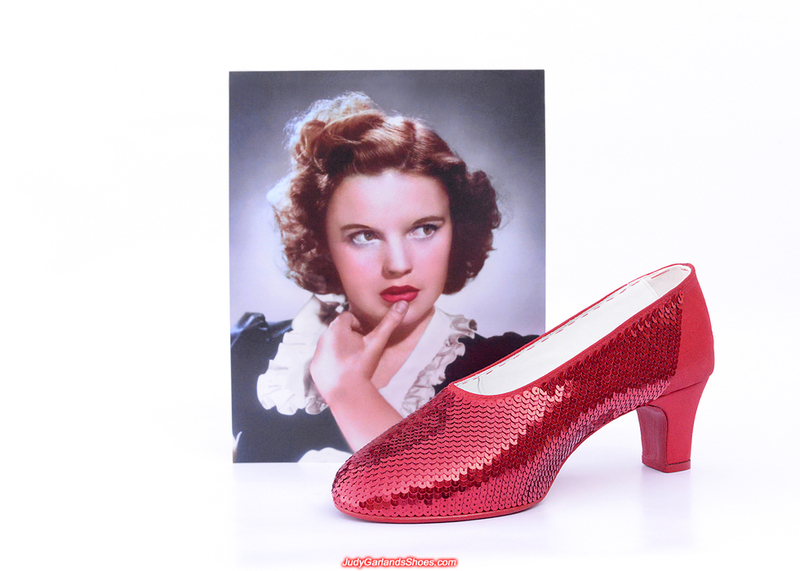 Our next project is an exciting pair of wedding ruby slippers in US women's size 10 for a beautiful lady who is getting married near the end of this year and she needs them early. This brand new pair of hand-sewn ruby slippers can be worn because they will be crafted using the same technique as the original ruby slippers for Judy Garland as Dorothy to wear in the 1939 film, The Wizard of Oz. 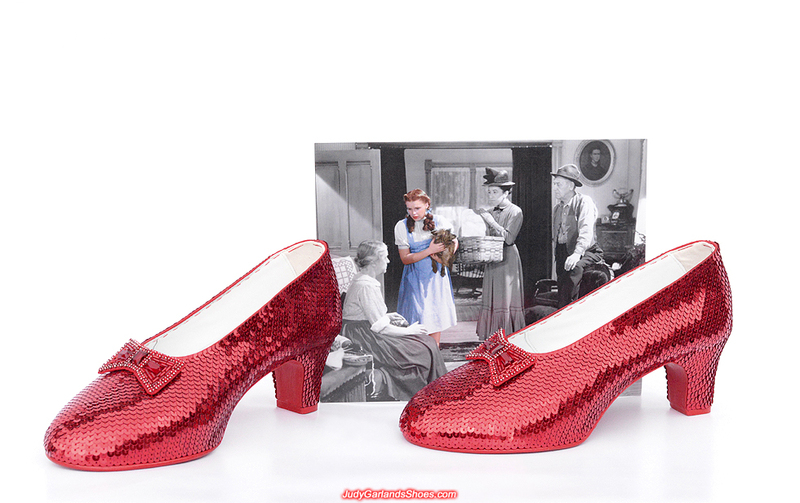 An exquisite pair on hand-sewn bows containing authentic materials will be used on the wedding ruby slippers. They are slightly bigger than the original bows so they suit a size 10 shoes which is much bigger than the shoes worn by the American teen singer-actress. There's a wedding coming soon and a beautiful bride will be walking down the aisle wearing our pair of hand-sewn ruby slippers so this is a very important project because we want to make the perfect ruby slippers for her to stand out and be comfortable in. 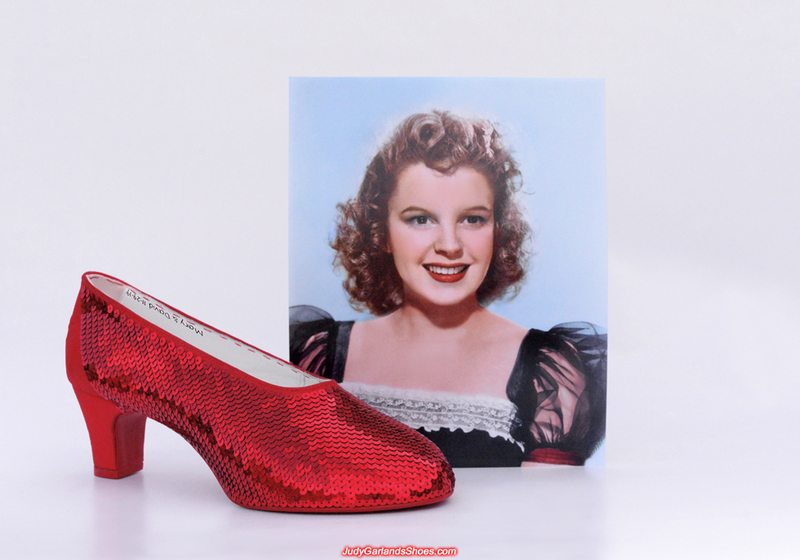 Our US women's size 10 shoes is handmade from scratch to match the shape of the shoes used for the original ruby slippers. The shoes is only bigger than Judy Garland's feet size. 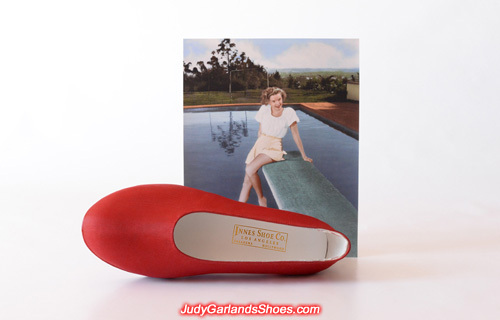 The right shoe is heat stamped with a golden embossed label reading "Innes Shoe Co., Los Angeles, Pasadena, Hollywood." We always write "#7 Judy Garland" along the top of our ruby slippers but this is the first time in our history that it's not there so it feels a little odd. Instead we have replaced this signature text with the words "Mary & David 11-29-19" as requested by the bride-to-be. 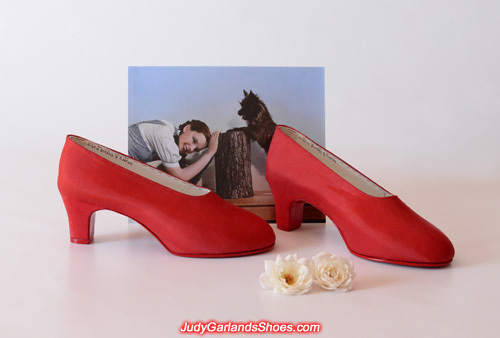 These hand-sewn wedding ruby slippers will be crafted to look brand new with our handmade and wearable mid-heeled shoes. 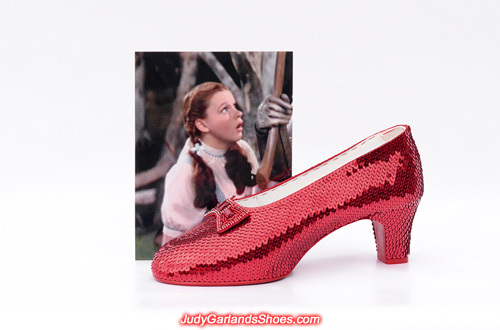 They will be constructed the same way as worn by Judy Garland as Dorothy in The Wizard of Oz. Judy Garland's presence will be felt on the couple's special day and she will be very proud because choosing to wear a stylish and iconic pair of ruby slippers of this caliber represents a true fan. Sequining is underway on the shoes for the wedding of Mary and David. The wedding coincides with the 80th anniversary of The Wizard of Oz. This is a lucky year to wear the ruby slippers. The right shoe is looking gorgeous and so is the babe with her thumb resting on her bottom lip. 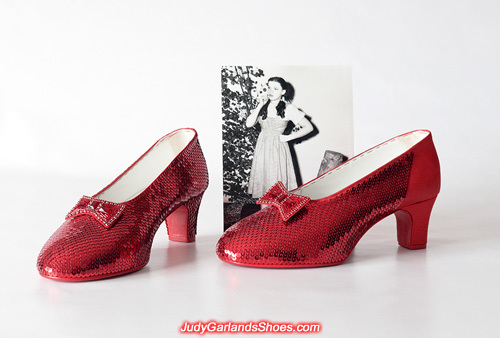 Size 10 is a big pair of shoes so there's more sequins that needs to be sewn onto the shoes than Judy Garland's size 5B. The shoe for the right foot is finished and it looks perfect and exquisite. 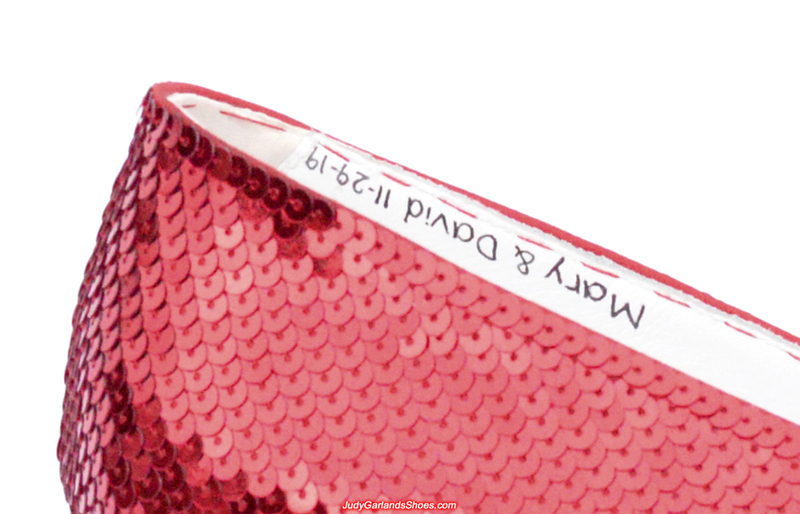 It's not every day you see a pair of hand-sewn ruby slippers worn at a wedding. The bride will look very stunning because these are the Rolls-Royce of ruby slippers. 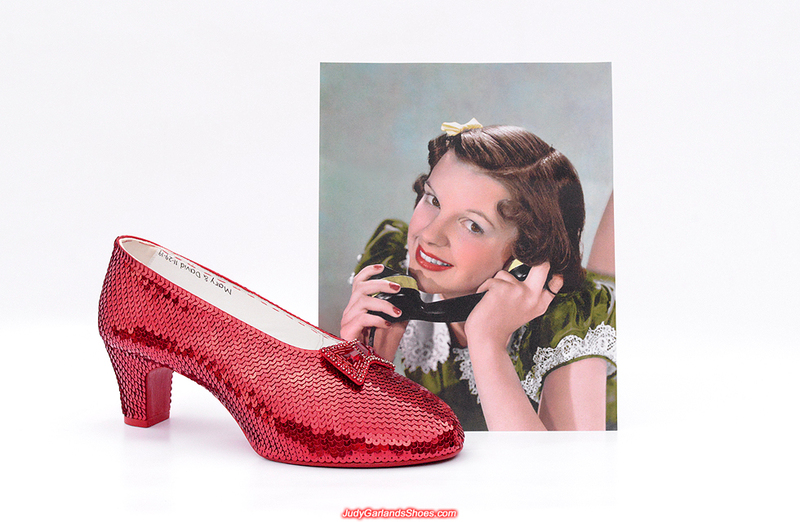 This pair of wedding hand-sewn ruby slippers in American women's size 10 is incredible but there's still a lot of sequining ahead to get the job done for the beautiful lady. 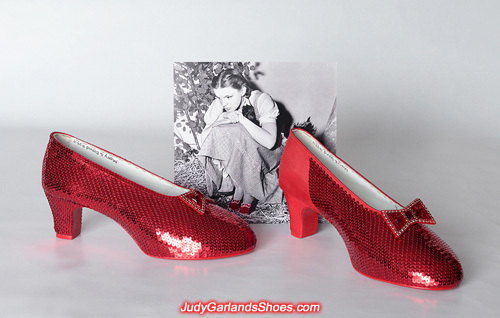 We finished crafting a pair of women's size 10, wearable hand-sewn ruby slippers, in January 2019 for the wedding of Mary and David. 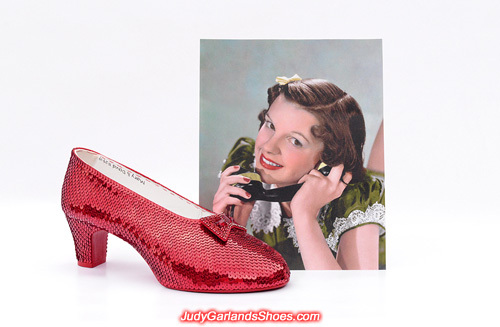 Judy Garland always had Hollywood superstar quality with her beauty, singing and acting ability. 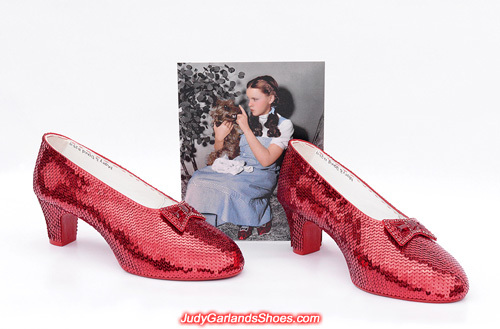 Her lead role as a young Kansas girl Dorothy in 1939's The Wizard of Oz made her win the Juvenile Oscar in 1940. Below is a very adorable 17-year-old American actress Judy Garland sitting with 37-year-old Canadian actress Norma Shearer at the 1940 Academy Awards. For more information and photos from the event, please see: Judy Garland wins an Oscar in 1940.